Here is a great way to display prices on hanging items! 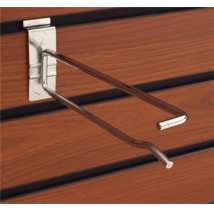 Heavy-duty chrome scanning peg hooks are made for slatwall. These slatwall accessories feature an upper arm that allows easy attachment of our Clear Label Holders (#2039 & #2040). The peg hook thickness is .228 in. For even more items, we ask you to take the occasion to review our full selection of peg hooks for slatwall at Specialty Store Services today.